After fastball phenom Prospero Stark’s baseball career​ craters in a Mexican jail, he retreats to a trailer park in the scorching Arizona desert. He lives in peaceful anonymity with a collection of colorful outcasts until someone leaves his former catcher’s severed hand on his doorstep. Beautiful, hard-living reporter Roxanne Santa Cruz, who keeps a .380 Colt and a bottle of Chivas in her car, joins Stark to help him uncover his friend’s fate, a dangerous pursuit that pits them against a ruthless gang of drug-dealing killers. DOUBLE WIDE is a rollicking page-turner. As twisted and bumpy as a desert road at night. Leo Banks crafts a fast-paced tale filled with colorful characters. He displays an excellent ear for bitter, cynical dialog and an unsparing eye for desperate characters running on empty. Read it! Phoef Sutton, New York Times bestselling author (Wicked Charms, Curious Minds) and Emmy-award winning TV writer (Cheers, Boston Legal). 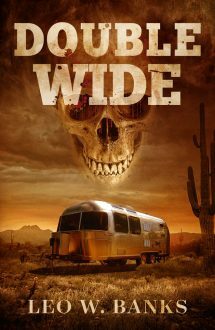 DOUBLE WIDE is a fast-driving thriller. Dusty and wicked and satisfying. Banks' strong noir debut will remind many of early Joe Lansdale. Smart dialogue helps propel the tight plot. It’s tough not to appreciate a madcap crime novel that incorporates drug smuggling, homicide, baseball, Shakespeare, and wayward body parts into its tumbling plot. Especially when the story also boasts keen and comical observations on life, a roadrunner pace, and a hardy but humane protagonist. Double Wide is single-minded entertainment of a subversively literary sort. More, please! Perfect reading for a coast to coast flight. Put it high on your list as an entertaining fictional account steeped in Arizona familiarity. Featuring a gaudy cast of characters, this farcical drama goes the distance against the backdrop of Corbett Field and the mean streets of Tucson. Banks is an award-winning local journalist and on top of his game in his debut novel. Double Wide is a slam-bang, fast-moving treat. I suspect we haven't read the last of Whip Stark. A crime fiction author to watch. Banks amazingly pulls all the diverse and seemingly unrelated plot elements together. This is due mostly to Stark’s laconic and softly sarcastic first-person narration. Banks’s descriptions are wonderfully evocative, and frequently contrasted with the ugliness of the Arizona cities just outside of the desert. The setting and characters, along with the inventive plot, make DOUBLE WIDE well worth your time. A sizzling debut novel. Banks succeeds in emulating the classics—much to our delight. More, please. It is hard to believe that this is Banks’ debut novel. Blending together the drug cartel, baseball, and an abandoned gold mine allows for a fun crime plot. The colorful characters have great banter between them, often showing their cynicism of the world. Banks writes skillfully and with deep love for the Arizona desert and his characters. He knows the worlds of the desert women, men and kids who live under the radar of entitled society—and he writes that world without sentimentalism or judgment. He writes about alcoholism and addiction with near-surgical understanding—and kindness. He writes about professional baseball with the same merciless grace. Leo Banks devotes as much of his craft and deep perception to the setting of “Double Wide” as he does to his plot and people.